This is the Week of Prayer for Christian Unity (18-25 January). 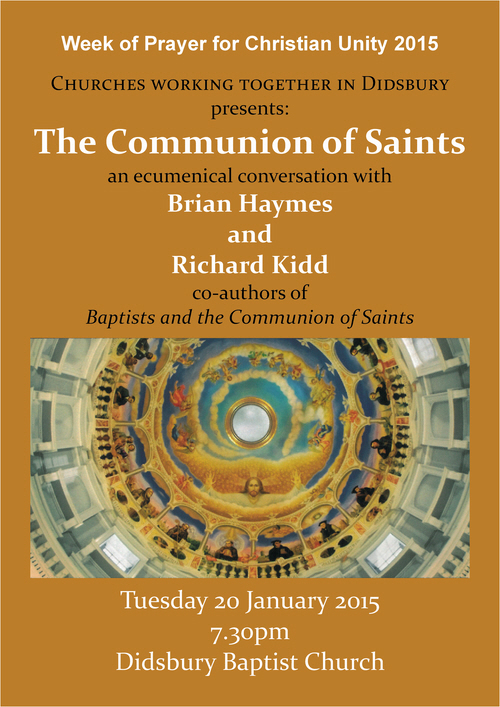 To celebrate this, we are to host an evening on the Communion of Saints on Tuesday 20 Jan at 7.30pm. All are welcome to attend what we hope will be an open and ecumenical conversation. Brian Haymes and Richard Kidd, co-authors, with Paul Fiddes, of Baptists and the Communion of Saints will help us to think about a neglected doctrine not usually associated with Baptists. Please join us if you can and bring your questions!